"Fast Pitch Orlando" is THE FASTEST growing Softball Tournament Company in Florida. Players, coaches and parents all love our Tournaments because we are very different. We guarantee a minimum of 4 games per Tournament but we play 2 games on Saturday and a minimum of 2 games on Sunday. (No more one and done on Sunday where you spend more time driving to the Tournament than you do playing.) We also understand teams are at various levels of their development. This is why we offer different Brackets within the same Division. This allows the strong teams to play against each other and enjoy great competition. This also allows the newer teams the ability to play newer teams and enjoy great competition as well. Thus all of the Teams playing in the Tournament have great games and everyone gets better. Providing a competitive atmosphere for ALL teams where each player has the ability to get better is really what Fast Pitch Orlando is all about. Fast Pitch Orlando is all about helping coaches and players with developing the FUNdamentals. We accomplish this through a series of clinics taught by Collegiate players and coaches. We also bring in Professional players from time to time as well. In these Clinics, the FUNdamentals are broken down and easily explained. Then the players have the ability to do drills and develop or fine tune their skills. Some of the best interaction for the girls is simply having the opportunity to meet and talk with the players and coaches they watch on TV. Again, Fast Pitch Orlando strives to provide the opportunity and tools necessary for ALL players to improve their skills as a softball player and young lady. This website will allow coaches, players and families the ability to keep track of their teams progress with stats and standings throughout the entire "Fast Pitch Orlando" season simply by registering on our site. Once you register, you will be able to enter your teams roster. This roster will be saved on our website and every time you want to enter an event all you will have to do is log in and sign up. It's that simple! Each event has its own dedicated website with team information, schedules, brackets and results for each tournament. Coaches will also have the ability to receive e-mail updates with scores and standings as well as being able to visit our instantly updated website to see how they rank. Inside your team profile, you will be able to add a team photo as well as view all your player stats. 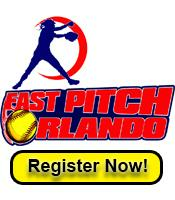 To get back to the "Fast Pitch Orlando" home page you can either click on the banner or the home button. You can also see who is playing in what tournament in the who's playing tab. Awards!!! "Fast Pitch Orlando" offers "Main Bracket Awards" as well as our "Survivor" Brackets for those teams that missed out on the "Big Game!" Our "Survivor Bracket" is for the teams that lose their first game Sunday morning. "Survivor" braket plays for awards too. Essentially Sunday will be divided into two events. Play hard and never give up!